When a tax liability is assessed, the tax itself represents only a portion of the amount due to the IRS. 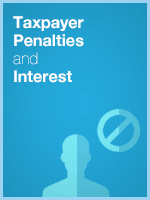 In addition to the tax, taxpayers are subject to a variety of penalties and interest. This course reviews the most common penalties applicable to taxpayers, including both civil and criminal sanctions. The amount and circumstances under which each penalty may be imposed is addressed, as are the mechanisms by which a taxpayer may challenge the application of the penalty. The rules for calculating normal and restricted interest are covered and the criteria for interest abatement are outlined. Differentiate non-assessable, assessable, and accuracy-related penalties. Recognize the circumstances in which a penalty may be automatically imposed. Determine the circumstances under which the negligence and civil fraud penalties may be imposed. Choose the appropriate arguments to successfully secure a penalty abatement. Calculate the appropriate underpayment and overpayment interest amounts. Identify the limited circumstances in which interest abatement may be obtained.